Egyptians had used the network of shafts and corridors over several centuries, starting from the 26th dynasty (664-525 B.C.) and continuing into the Ptolemaic period, which ended with the death of Cleopatra in 30 BC (from the MSN website). The Egyptian-American mission operating in Tal al-Borg area in north Sinai discovered remains of two fortresses from the Pharaonic l8th dynasty. This is a very short article from the Egyptian State Information Service. Currently only in French, but shortly to be published in English as well, this site is about Egyptian cereals in general. Different sections look at the basics of cereals in ancient Egypt, bread making (ancient and contemporary), and the use of cereals in different contexts. A fascinating site, even with my abysmal French - I can't wait for the English language version to arrive! 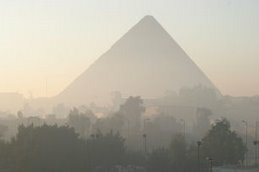 There is also a link on the site to the English language website of the Dokki agricultural museum in Giza, Cairo, which is well worth a visit in its own right: (http://museum.agropolis.fr/pages/expos/egypte/fr/museum_cairo/index.htm). Egypt said Sunday new mummies in wooden coffins dating back to the 7th Century B.C. have been unearthed at the Giza Pyramids near Cairo. An article by Zahi Hawass in Al Ahram Weekly about the Pyramid Builders' Village at Giza. "The discovery of the tombs of the Pyramid builders has provided us with vital information about the workmen who actually constructed the great Pyramids of Giza and has enabled us to reconstruct the age in which they lived." "The Czech Egyptology has got an interesting history. It is not a well-known fact that the first Czech Egyptologist was the first director of the Egyptian collection in Bologna, Italy in the second half of the 19th century. However, the first real Czech Egyptologist was Professor Frantisek Lexa who was appointed Professor of Egyptology at our university in the 1920s"
It shows a royal decree, written in ancient Greek, Demotic and Hieroglyphs. The inscription consists of 67 lines of Greek text and 24 lines of Demotic along with traces of Hieroglyphs outlining the calendar reform and praising Ptolemy. It mentions King Ptolemy III Euergetes I along with the date 238 BC. There is an interesting reference to the king having imported grain from Syria, Phoenicia and Cyprus to alleviate famine in ancient Egypt and the mention a reform of the ancient Egyptian calendar which was not in fact actually implemented until some 250 years later under Julius Caesar. 100 ancient Egyptian objects currently on display at the Milwaukee Public Museum are touring North America - this is the largest selection of Egyptian antiquities ever to travel to North America. The exhibit's climax is a full-scale re-creation of Pharaoh Thutmose III's burial chamber. After Milwaukee, the show travels to the Denver Museum of Nature and Science, Sept. 12, 2004-Jan. 23, 2005; Dayton Art Institute, Sept. 1, 2005-Jan. 3, 2006; Frist Center for the Visual Arts, Nashville, Tenn., June 11, 2006-Oct. 9, 2006; Portland Museum of Art, Portland, Ore., Nov. 5, 2006-March 4, 2007; The Museum of Fine Arts, Houston, Sept. 2, 2007- Dec. 31, 2007. A German-Egyptian research team working at Tell Basta, ancient Bubastis, have found a trilingual stone As the name lets assume, it concerns with the Bilinguae a stone, on which the text is fixed in two languages. As with the Rosetta Stone there are two Egyptian writings - the older Hieroglyphisch and later demotic - as well as Greek. It cotains a copy of the Kanopus decree, from the reign of the Ptolemy III in 238BC. This site is in german. There is an image of the stone, but it is a very poor quality photo. I don't read German but I'll post with more information when I find an English report. The origins of cattle is important to an understanding of the roll out of agriculture in Africa, including Egypt - Fred Wendorf has found that cattle were a crucial component of one of the earliest agricultural communities in Egypt in the south-west Western Desert. Interestingly, no cattle remains were found in the Faiyum which is the home of Egypt's other early agricultural community. "While the Sinai Peninsula, connecting Egypt with the Middle East, traditionally has been seen as the obvious overland route for the coming and going of people and animals, commodities, seeds and cultural ideas, the British researchers are finding more and more proof of communication across the 50 kilometres of the Red Sea that separate Djibouti and Yemen since the beginning of mankind." From Afrol News. "A group of love poems have been found in an excavated workers' village on the outskirts of the Valley of Kings, where many pharaohs are entombed. The verses allow poetry lovers and Egyptophiles alike to tap into the emotional side of Egyptian daily life". From the National Geographic. http://www.uk.sis.gov.eg/online/html11/o150424z1.htmThe temples of Kalabsha Island in Aswan will be opened next month for visitors following a comprehensive restoration that covered the archaeological site. There are rock inscriptions of animals, boats and hunting scenes dating back to the Old Kingdom, two temples of Beit Al- Wali and Garf Hussein from the New Kingdom, the stele of King Ahmos II of the 26th dynasty, Kalabsha temple and Kartas chapel of the Ptolemaic age. The first Tutankhamun exhibition to be held in Europe for more than two decades opened in the presence of Mrs Suzanne Mubarak. The inauguration of the Tutankhamun exhbition which displays more than 120 objects that once belonged to the legendary Tutankhamun and other royal members of the XVIIIth Dynasty. "A unique website puts the wonders of ancient Egypt in the palm of your hand" A discussion of the CultNat website www.eternalegypt.org, which uses all the bells and whistles of web technology to bring Ancient Egypt to life for web visitors. "Egyptologist Ashraf Okasha traveled with "The Quest for Immortality: Treasures of Ancient Egypt" from Cairo to the Milwaukee Public Museum and has stayed in town for several weeks as a representative of the Supreme Council of Antiquities of the Egyptian government. Okasha has worked as an inspector of antiquities at many famous archaeological sites from the Valley of the Kings to the Temple of Queen Hatshepsut. He spoke with Journal Sentinel reporter Jackie Loohauis". From the Milwaukee Journal Sentinel. "The epic romance between Egyptian queen Cleopatra and the Roman general Marc Antony was immortalized on a Roman vase that is now housed at the British Museum, according to an expert in classical art" - a comprehensive article discussing what, if accepted, will be one of only very few representations of the famous couple. Hierakonpolis is one of Egypt's most important sites, dating from the Predynastic when it became the major power of Upper Egypt. This site details the excavations and has some marvellous photographs of the excavation and artefacts that have been discovered. It has been updated recently. An article from the St Louis Despatch about the controversy surrounding the repatriation of cultural items removed from their original homelands. One of the key artefacts in this debate is the Nefertiti bust held by the Berlin Museum, which Egypt has been asking to be returned because of the manner of its removal. Al-Ahram Weekly article about the past of Siwa Oasis. This is the first issue of a two-parter and puts Siwa into its historical context, from Palaeolithic times until the Muslim invasion in 641AD. There is a small bibliography at the end for those wishing to read further. From the SwissInfo website: "The most important exhibition of ancient Egyptian artefacts to be seen in Europe for over 20 years has opened in Basel. 'Tutankhamun – the Golden Beyond' has over 50 pieces from the tomb of the mysterious boy pharaoh, as well as a further 70 items, many of which have never been seen before outside Egypt". Egyptologists have pieced together fragments of the first known ancient portrait of a pharaoh drawn from the front rather than in profile. New discoveries at Abydos have uncovered the tomb of the first king of the First Dynasty, whose name was Aha. The surrounding burials, containg both human and animal remains, have suggested to some that when the king died, others were sacrificed to serve him in the afterlife.